I’m certainly biased when I say that Regensburg is one of the most interesting cities in Germany, as I currently live here. As with many cities in Germany, it’s a mixture of new and old. Unlike other cities, however, Regensburg did not sustain major damage during the Second World War, leaving most of the old buildings intact. If you visit Regensburg, you will see a medieval city that still living. Cities like Rothenburg get a lot of tourist, because it’s a walled medieval city. However, it’s more tourist trap than city. Regensburg has about 130,000 people living here. There are large companies like Siemens and BMW that employ thousands of people. The University of Regensburg, built in 1967, has about 20,000 students. So while this city is almost 2,000 years old, it’s still flourishing in our modern times. The Dom and the old bridge at night, with the sugar factory smokestack in the background. Regensburg is located in Bavaria in the south of Germany, about an hour away from the Czech Republic. It lies (mostly) on the south bank of the Danube (Donau) River. It is also the point where the Regen River flows into the Danube. Munich lies to the south, a little over an hour away by autobahn (A93 and A9). Nürnberg (not to be confused with Nürburg with its famous track) is a little closer. It’s less than an hour away. Frankfurt is about 2.5 hours by autobahn A3 (well, with Porsche driving), and Salzburg about the same distance to the southeast. Vienna and Prague are over 4 hours away. 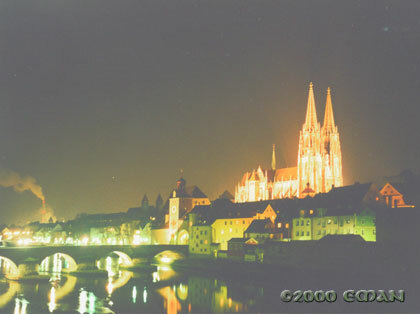 Regensburg was founded by the Romans as Castra Regina in 179 A.D., as its northern border on the Danube (Donau) river. That was a long time ago. They actually had a 2000 year celebration here back in 1979. By my calculator, that’s only 1800 years, but any excuse for a party with beer is good enough in Germany, I suppose. Its status has risen and fallen several times since then, due to changes in trade routes and the political climate. It was left relatively untouched during World War II, keeping its Altstadt (old city) well preserved. For example, my apartment building is older than the United States (I like saying that). Two notable old things in the city are the Steinerne Brücke (Stone Bridge) and the Dom (cathedral). The Celtic name for Regensburg is Ratisbona. You still see this name around the city, and is used affectionately (at least by my perspective) by the residents.